Malnutrition causes at least 53% of deaths in women and children worldwide according to the World Health Organization. In Nigeria, the situation is even more alarming as records show that malnutrition kills 100 children and at least six women of child bearing age every hour. In many cases they die not only because they lack food, but essential micronutrients. 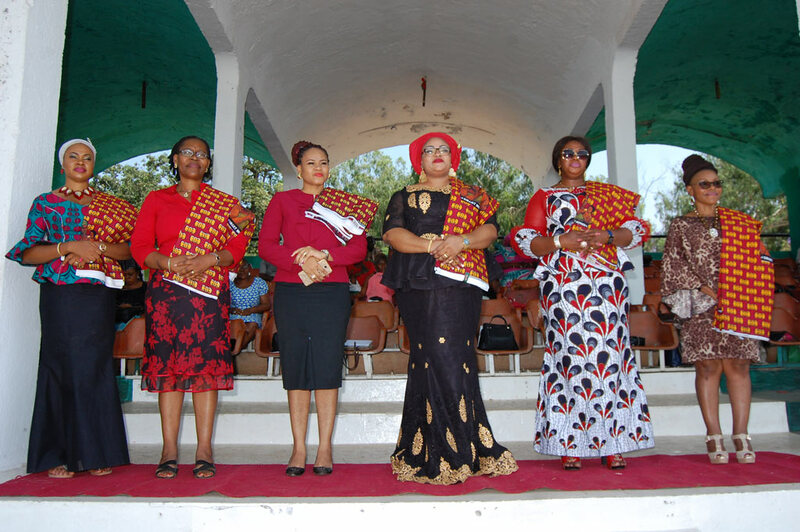 L-R: Princess Akunna Ubosi (fourth), wife of the Speaker Enugu House of Assembly, and wives of Honorable members in Enugu State. To highlight this problem, HarvestPlus Nigeria brings people together every year under the umbrella of the Nutritious Food Fair (NFF), where it showcases agricultural solutions emphasizing biofortified and nutritious foods. The event provides HarvestPlus and partners the opportunity to address more than 10,000 participants to further unveil how common crops like cassava, maize, and sweet potato now have the right amount of micronutrients that could forestall malnutrition and hidden hunger in Nigeria. The third edition of the annual event, themed Scaling-up nutritious food choices: Engaging everyone everywhere, specially recognized the vital role women play as drivers of health. It therefore trained and commissioned over 5,000 women as “Smart Mothers” who will in turn act as ambassadors of nutritious feeding in the country. 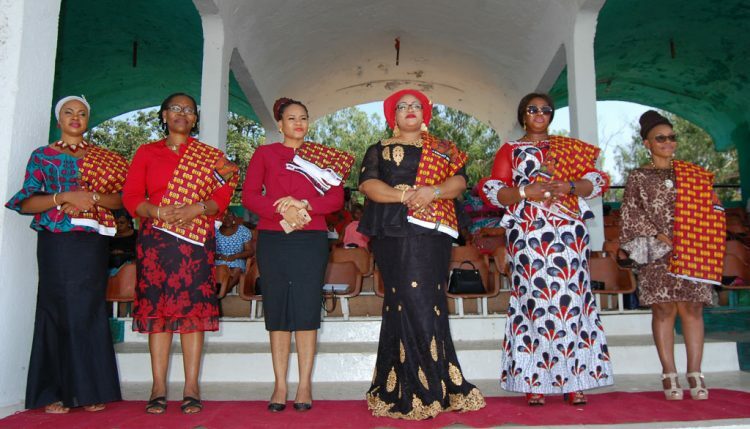 “By feeding the family right, women can help promote good health and avert prevalent and terminal illnesses in the country,” said Princess Akunna Ubosi, wife of the Speaker Enugu State House of Assembly who launched the initiative together with wives of honorable members in Enugu State. Princess Ubosi also expressed confidence that the training sessions will further help to alleviate poverty in the State. Cross section of happy Smart Mothers. According to Paul Ilona, Country Manager, HarvestPlus Nigeria, tackling the challenges of malnutrition requires innovative approaches that are quick and smart to address emerging limitations. He said unless women are empowered, malnutrition cannot be eradicated in the country. Ilona explained that it was so because women have a primary role to play in addressing the scourge of malnutrition in Nigeria. He also applauded government policy on supplementation and food fortification noting that the biofortification agenda of HarvestPlus complements the effort of government. “Having a multipronged approach in solving a single problem is the way to go, but we must ensure that all arms contribute optimally…the contribution of HarvestPlus makes it possible for common foods like cassava, maize, orange sweet potato to become the channel for delivering the daily nutritional needs of people,” he said. Another clear objective of the 2017 NFF was to unlock the full potential of the biofortified sector in job and income creation. Hands-on trainings in agronomy, processing/value addition, and marketing of vitamin A cassava and maize were offered in the bid to create at least 3000 jobs in the sector. Speaking during the opening ceremonies, Hon. 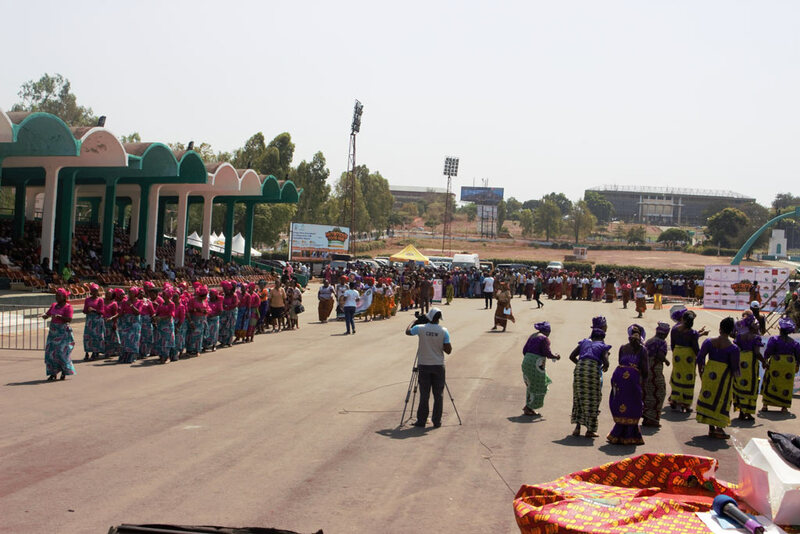 Anayo Agu, Special Adviser to the Enugu State Governor on Small and Medium Enterprises and Investments Promotion said the fair will help ordinary people do extraordinary things. He commended all partners with which HarvestPlus works to advance the cause of eradicating global hidden hunger. The 2017 NFF took place at the Michael Okpara Square, Enugu State on 28‒30 November, and showcased the latest automated planters, roasters, pressers, graters, flash dryers among others for processing vitamin A cassava, maize, and sweet potato. It was attended by more than 10,000 participants including policy makers, food regulatory agencies, development, and private- and public-sector partners. Other participants included members of the national assembly, Special advisers to the governor of Enugu State, wives of honorable members of the state, women and youth groups, along with representatives from Dangote Foundation, Technoserve, Ashoka, SUN Business Network, NEXIM Bank, and the international community. HarvestPlus is a model for multi-partner, global research intervention where researchers have successfully used conventional breeding techniques to introduce vitamin A into cassava, maize, and sweet potato. Soon there will be rice, sorghum, and millet with zinc and iron added to Nigeria’s food basket. HarvestPlus is funded by DFID, the Bill & Melinda Gates Foundation, and USAID.